This is the hospital that inspired Riverside. 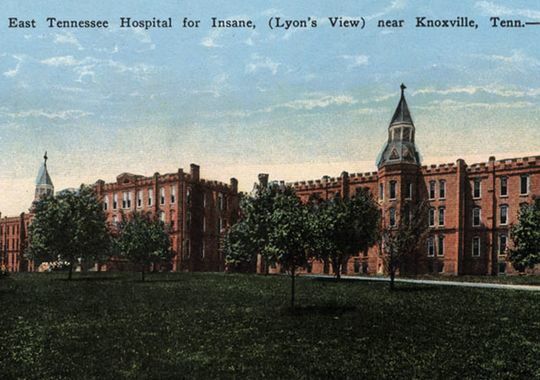 Originally, it was known as East Tennessee Hospital for the insane, and was then renamed Eastern State Hospital. Eventually, the hospital was renamed as Lakeshore Mental Health Institute. It was closed within the past couple of years, a decision that was met with a lot of resentment among the mental health community here in the area. 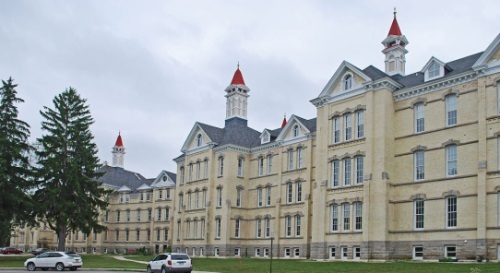 One point of pride is that Lakeshore was among the first institutions in the nation to house minors in a separate facility, though this only came about sometime in 1972 or 1973. The postcard below came from a news story that was done by a local news channel back when Lakeshore was closed down. East Tennessee Hospital for the Insane, later Eastern State Hospital, then Lakeshore. Most of the buildings have since been torn down. Acutally, the wings that can be seen in the postcard were torn down in the late 70s when all of the reforms were being done, as they were beyond repair, and a fire hazard, to boot. The main administration building, the larger of the buildings on the left, has been left standing. There’s not really a lot of information avaliable about Lakeshore, and even then, it’s hard to discern what is truth, and what is just rumors and speculation. Most people didn’t know what was going on at the facility while it was in use, and most people were quite content to keep it that way. The photo on the right comes from the University of Tennessee Library’s Special Collections, courtesy of WBIR.com. 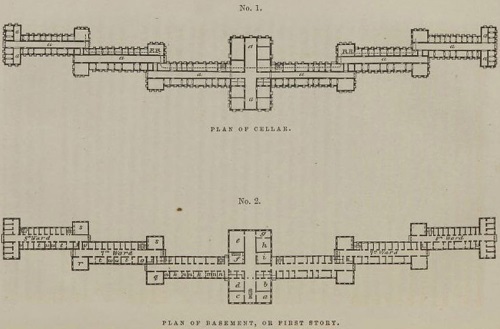 It’s the only image I’ve ever seen of the original Kirkbride Plan building. Most people born in the past few decades would never recognize that beautiful building as the Lakeshore hospital they’ve heard the awful stories about. I always think that it’s interesting to see what has inspired the ideas behind stories, so I just thought I would share this. Also, I feel that it’s just a very interesting subject, along with an important part of the history of the area, but that’s just me! So I have no idea when I’m going to get back to working on my novel. Finals have now started, and it’s hectic. I just finished up two essays, and right now I’m in the middle of editing a video for French that we spent all day yesterday filming down on campus. But I am pretty convinced that I will go back to working on it at some point, maybe once the semester is officially over. However, I do want to post a few bits and pieces of it on here. And this is one of those parts. This is from somewhere around chapter… five? I think. I’m not sure. I’ve cut a few pieces to edit so that they can be put up here. This was kind of a tedious scene to write. I had a very specific image in my head when I was thinking about what I wanted the building to look like, but conveying that idea,in a way that made sense to someone other than myself, was a bit of a challenge. For this post, I’ve decided to add a couple of pictures that are a bit in line with the image I wanted. The hospital in the story, Riverside, is based loosely on a real-life psychiatric facility here in East Tennessee, that suffered from a slew of problems, well into the 1970s, when the conditions were exposed and sweeping reforms were enacted. The facility shut down within the past couple of years. The design shows the idea of the “staggered wing” design. out of favor in the early 1900s, the idea was part of a larger movement known as “moral therapy”, which was a huge leap forward for the field of mental health. The buildings were massive, built with several connected, staggered wings. They usually included several acres worth of grounds, as well. The design feel out of favor in the mid to late 1890s, due to the massive expense of building and maintaining the facilities. Construction on one of the last Kirkbride hospitals, Fergus Falls Regional Treatment Center, in Regional Falls, Minnesota was begun in the mid 1880s, and completed in 1912. 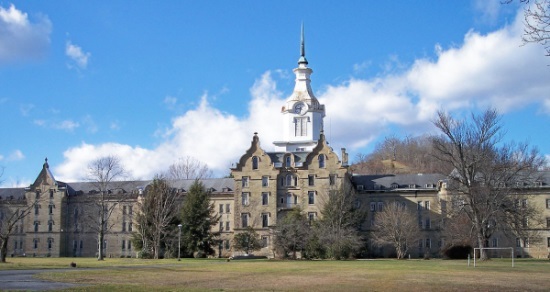 Other notable Kirkbride hospitals include Danvers State Hospital, in Danvers Massachusetts, Trans-Allegheny in Weston, West Virginia, and St. Elizabeth’s in Washington, D.C. Okay, I think that’s all I want to say as far as background things go. 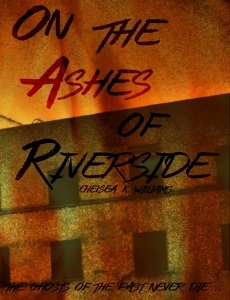 Here’s the first excerpt from my NaNo2014 work, On the Ashes of Riverside. Kenna couldn’t help but smile at Nanook’s exuberance when he saw her. She loved dogs; it didn’t matter if you’d been gone five minutes or five hours, they were always so honestly excited when you came back. Out of the corner of her eye, she saw Bagheera slinking out of the laundry room where he’d likely been sleeping on top of the dryer. He headed into the kitchen, clearly anticipating food. “And there’s the difference between a cat and a dog,” she grumbled to herself. She dropped her things and went to pour food into the cat’s bowl, then grabbed Nanook’s leash from its place by the door. After an enthusiastic struggle, where the dog was far more hindrance than help, Kenna snapped the leash on and headed back out into the hallway to take him outside. Trans-Allegheny in Weston, West Virginia. A large inspiration for the design of Riverside. original hospital had been built. The grounds had originally included several acres of farmland that patients had helped work, but the state had sold off much of that land in the years after the hospital closed. As Nanook wandered and turned in circles with his leash at full extension, Kenna took a moment to truly observe the building. She could only imagine what it must have looked like at one time. She’d seen an old post card in an online article, sometime back around when the development plans had been announced, but it had only been a close up of one of the complexes many buildings. Traverse City State Hospital. Traverse City, Michigan. Now converted to apartments. the restoration effort, and none of the new additions seemed out of place. Even the balconies, most certainly not original to the building, had been designed to look as though they had been there as long as the structure itself. Startled, Kenna jerked forward and accidently tugged on Nanook’s leash, earning herself the type of whine only an unhappy husky could produce. She apologized and shushed him with a treat she’d brought out, then turned. Adrian was standing out, huddled in a black hoody, while Geist raced from tree to tree and flower to flower, leaving nothing uninvestigated. “Sorry,” he told her as he approached her. “I’d been calling to you for a minute, but you didn’t seem to hear me.” Even in the dim light, his expression held a hint of concern. “You were staring at the building like it was the most fascinating thing you’ve seen all day,” he commented. Geist tried to make a run for a passing squirrel and Adrian reeled him back in. His concern melted into amusement at that. “My guess is it looked terrifying,” Adrian muttered. Kenna glanced over at him. He was staring up at the building, as though trying to imagine it as it would have been over a century ago. “To promote wellbeing and healing,” Adrian finished for her with a touch of impatience. Kenna nearly asked him how a vet student would remember what had likely been a throwaway topic from an introductory psych course, when she remembered who he was related to. “Well they were,” she finished. She crossed her arms over her chest, mindful of the leash still in her hand, and pretended she didn’t look as petulant as she did. “It almost sounds like it makes you angry,” Adrian observed, his tone carefully casual. For a brief moment, Kenna spared a thought to wonder what kind of conversations Adrian had been privy too, growing up in close quarters with someone like Dr. Hayes. Then, she turned her attention back to the building. Though the side they were looking at faced the river, it was technically the back of the building. When she was finished, they both stood in silence for a moment, both thinking about what she had just said. He trailed off and shook his head. Briefly, Kenna thought back to something Cade had said when she mentioned where she would be moving to. “Cade says a lot of unexpected things,” Kenna assured him. After a moment, a thought occurred to Kenna. “You said that you’ve lived her for a while before I moved in, right?” she asked, turning her attention away from the building and back to Adrian. Kenna opened her mouth, then faltered, uncertain if there was a way to ask her question without sounding like she would have belonged in Riverside when it was a functioning hospital. “Have… have you ever noticed the smell of smoke in the hallway or in any of the rooms?” she asked him finally. Silently, she prayed that he didn’t look at her like she was crazy. “And here I thought I was losing my mind,” Kenna muttered. “Only if I’m losing mine, too.” Adrian told her. Kenna was about to agree with him when she realized what he’d just said. “Yes, he did. He never told you all about that?” Adrian looked surprised. “He’s not exactly the most talkative person in the department,” Kenna reminded him. Now that she actually thought about it, it wasn’t particularly hard to imagine the aloof, detached Dr. Hayes working in a place like Riverside. Adrian winced slightly at her summation of his grandfather, but didn’t contradict her. They stood for another few minutes, Kenna processing this new information about Hayes, and Adrian watching her as though waiting for a response. It was only when Kenna started shivering faintly that he frowned slightly. Fairly happy with it at the moment. So the NaNo site has been reset, though I think all of the forum posts from last year are still up. (Does anyone know what’s going on there? Are they going to reset those too? Anyway, I’ve already updated my author page on the site, and figured that I would go ahead and post the summary here, too. Riverside Hospital was closed down. The hospital sat abandoned for decades. Rumors of ghosts and other strange sightings spread like wildfire. In the spring of 2011, a private developer purchased the property. Plans were announced to repair and renovate the buildings and turn them into a modern apartment community. Riverside Plaza opened three years later. Graduate student MacKenna Sheridan, the building’s newest resident, is thrilled to finally be moved into her new apartment. But the past never stays hidden and Kenna’s excitement fades rapidly. Before long, odd things begin to happen. At first, they’re easily explained away: a flicker in the mirror and quiet whispering in the hallways. But things escalate quickly. The sounds of crying and screaming echo in the halls, the smell of smoke fills the air, and fire alarms sound with no obvious cause. Unnerved by the increasingly common occurrences, and aware of the building’s troubled history, Kenna tries to shed light on the hospital’s troubled past. However, her search proves difficult; many records are sealed, and those involved have no interest in discussing the past. It seems the hospital wants to keep its secrets. But just how far did someone go to bury those secrets? I’m actually really excited this year. I’m hoping that I’ll not only be able to meet the word count goal, but actually finish the story itself, too. With the outline I’ve written, I hope that will happen. Happy planning to all of this year’s NaNo participants! We’re in this together! Otherwise known as my complete inability to summarize. Seriously. I can’t be the only one who has this problem. One year at a local NaNo meet-up, we were challenged to summaize our stories in two sentences. And then everyone else is sitting there writing away, and I’m just sitting there staring at my pen like ive never seen one before. My summaries tend to be long. I try not to be wordy and redundant, but I love detailed summaries. I love vivid descriptions (Flowery language if you want to be mean about it.). Actually, I’m not sure where I picked that up either. My grandmother, where I picked up a lot of my language, mechanics, etc., did not like using it, and it always seemed to stun her that I did. Though, like I said, I try not to be really tedious about it. Too vividly or too many details? It’s probably just unnecessary filler. 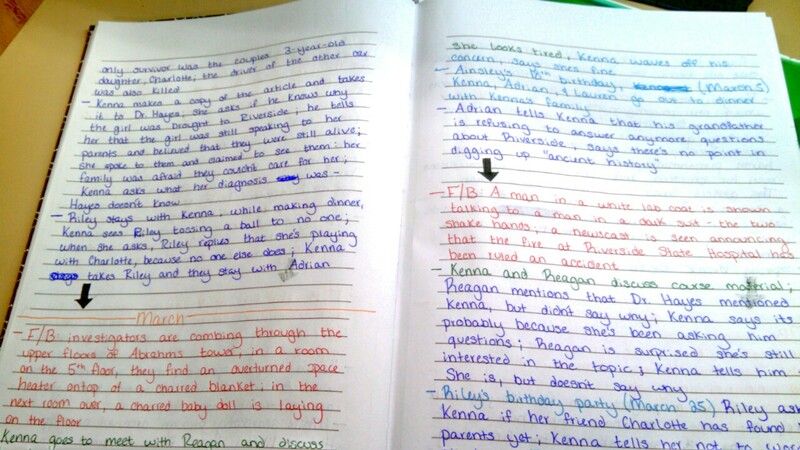 Two pages of the handwritten version of my outline. Yes, it’s color coded. Right now, I’ve already done 3 versions (two revisions) of the summary for this November’s project. I think I’m finally happy with it, but it’s still so LONG. Seriously. Of course, my “outline” is about 22 printed pages, but that was intentional. I think my problem is that I don’t want anyone who reads my outline to have too many questions, at least questions other than, “oh, what’s going to happen? I want to read this.” I don’t make the mistake of telling everything that happens, that’s what the story is for, but I struggle with how much is enough. “Well, if I say this about this, will people understand what I’m talking about? Should I try to include a tiny bit of backstory about it?” And that’s where I create problems for myself. Trying to figure out how to fix this is an ongoing thing for me. Finally, what I did this time was print out a copy if the original summary and just go through and slash through things. Words, phrases, and whole sentences got cut. However I did actually keep the revised, longer version. That one will go up on the Nano site once it resets and will become my “official” summary for the time being. The shorter will be posted on here on the side bar, underneath the cover. I’ll probably also include both in a post, or something. I’m kind of proud of the longer one.